Having been a full-time flight instructor for nearly 10 years now, I have seen the many ways in which pilots negotiate the normal approach-to-land maneuver from the abeam position. As with my own initial instruction, most pilots have been taught to focus on establishing given airspeeds for each leg of the approach, and to attempt to control the vertical approach path using power. This technique likely stems from the 'old school' ways of making an approach-to-land in airplanes without flaps. While this technique is legitimate, it requires more diligent control of the power to intercept and track a vertical approach path due to varying inertial forces and changing headwind components on approach. The many pilots who have come to me for proficiency or advanced training in high-performance airplanes generally cannot intercept and track a VASI glideslope with any consistency using this technique. These pilots fixate on the airspeed indicator causing them to delay in adjusting their height along the approach path with power. This action adds to the delay in accelerating and decelerating the airplane using power. In an effort to improve the performance in this area among the already certified pilots that train with me, I begin by introducing them to the concept of making a constant-rate descent during approach-to-land. This technique was once advocated in previous editions of the FAA's Flight Training Handbook which stated "Since on a normal approach the power setting is not fixed as in a power-off approach, the power should be adjusted as necessary to control the airspeed, and the pitch attitude adjusted simultaneously to control the descent angle or attain the desired altitudes along the approach path." In other words, use the power to control airspeed such that it matches the desired 'descent gradient' (altitude loss per unit distance), or VASI glideslope. The Flight Training Handbook was later superseded by the Airplane Flying Handbook in which the same sentence now reads "Since on a normal approach the power setting is not fixed as in a power-off approach, the power and pitch attitude should be adjusted simultaneously as necessary to control the airspeed and the descent angle or to attain the desired altitudes along the approach path." In essence, the FAA is now promoting the use of control-performance techniques, much like those used in intercepting and tracking an ILS glideslope, whereby specific power and pitch combinations can also be used to intercept and track a visual approach path as desired. Transition to using this technique is relatively easy for IFR pilots, but is sometimes met with resistance among VFR-only pilots because they are at first unsure what the sight picture of a 'normal' approach path looks like, and generally have never been taught to use specific power settings as numeric parameters during approach. That said, the control-performance technique I teach to improve one's normal approach-to-land (in a C182) is to begin with trimming for 90kts on downwind using 15-17in. manifold pressure, then promptly reduce power to 11-12in. abeam while extending 10deg flaps and pitching for a 500fpm descent using the VSI. Assuming calm winds at the surface, the 500fpm constant-rate descent is re-established (and trimmed) as flaps are extended sequentially while turning base at 800'agl and final at 500' agl and manifold pressure is continually reset for 11-12in., as it tends to rise with the decreasing airflow through the propeller as airspeed slows. This technique will provide more consistent results in intercepting VASI or 3-degree approach path upon joining the final approach leg, at which time the pilot should be focused on pitching to maintain that approach path, while adjusting power to match the groundspeed with the desired descent gradient or that of the VASI. The stronger the headwind component, the more power will be needed to match the descent gradient, assuming the pilot maintains the same pitch attitude (adjusted down slightly to counteract the thrust moment). Of course, as the plane reaches a point at which it can glide the rest of the way to the runway, the power is reduced to idle and then the pilot can finally pitch to maintain 1.3Vso or recommended final approach speed while gliding into ground effect for landing - herein lies the difference between an 'approach-path' and a 'glide-path'. It typically takes about 10 circuits around the traffic pattern for pilots to realize the benefits and begin demonstrating this technique with some reliability. During this practice, the pilots try to revert to pitching for airspeed or at least correlate the approach-path to expected airspeeds on each approach leg, which necessitates covering the instruments entirely, forcing them to pitch for what they 'think' is a normal approach. Most pilots are surprised to find that when faced with deciding whether they are too high or low, and too wide or close based on sight picture alone, they generally will intercept and track a 'normal' rectangular course at the descent gradient associated with a 500fpm descent - this is confirmed by revealing the VSI to them on each leg of the pattern, as well as by the red and white VASI indication. Without the airspeed indicator they are also forced to visually correlate their distance to the runway with the remaining height in the approach, and more often than not quickly adapt to adjusting power to match the descent gradient. I invite all CAP pilots to contribute to this discourse and attend my quarterly landing clinics to see for themselves how this technique can improve their proficiency in making consistent 'red & white' approaches to land. Having been a member of Sq. 188 for the past 22 years, I can't express enough how things have grown in Civil Air Patrol. 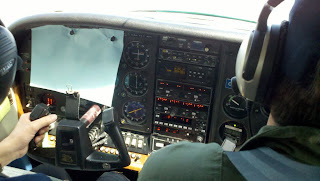 This Sunday Luis Rivas, and I had a chance to work on landing technique for a Cessna 182 with Capt. 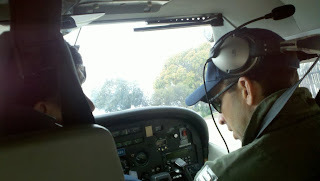 Andrew Dilworth, a CFI from Sq. 80. I have been flying on and off since 1968, and this was the first time I had someone show me how to land by the numbers. I consider myself a safe pilot, but also a person who is always interested in learning something new to apply to my flying toolbox. This was a very informative event, and I have to salute Capt. Dilworth for his input on this subject, and taking the time from his normal work schedule to teach us in this vital aspect of flying. So many years CAP has a person take their Form 5, and everyone would hope that they wouldn't ding the airplane. If there was any instruction, it would happen after someone crashed, or someone would finally ask a CFI if they could get some instruction. This was not the way to stay proficient. We were more about relying on just the fact that we past our Form 5, and leave it at that. Some people felt that it was showing weakness asking a CAP instructor to work with them. Now, there is a concerted effort by members of CAP to make sure that we cover all aspects of flying. I am sure this will continue, and this organization will be known as having some of the best pilots in the world due to our safety record, and just plane flying technique when other people fly with us. I look forward to many other times like last Sunday. Sunday Mar 28th.....Landing Clinic. Noel and I went up with Andrew to fine tune our landing skills. Having had Andrew as a CFII, I knew I was in for a great learning experience and I was not disappointed. It was a great opportunity to re-examine a lot of skills I already had and to add some new insight and techniques. By the end of the session, we had several tips on how to more effectively execute the traffic pattern and landing. All in all, one of the most effective 1.2 hours of flying in a long time! We met Andrew Sunday morning at SQ80 HQ. Andrew started with some probing questions about landing techniques with the goal of contrasting the set-airspeed approach and the concept of the constant-rate-descent approach. After we grasped the concept, it was time to put it into practice. The first sortie I got to sit in the back and watch and learn from Kevin's flight. It was enlightening when Andrew covered up the six pack with a blue sheet of paper, forcing Kevin's eyes out of the cockpit. Then it was my turn! The constant descent technique is an enlightening experience that greatly enhanced my situational awareness by forcing my head out of the cockpit and away from the covered up instruments. The airport environment can be very demanding and a good lookout is essential, especially at an uncontrolled field like Watsonville. 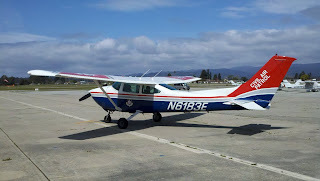 I also learned that the best landing technique in the heavy-nosed Cessna 182 is not only to ensure that the stall horn is sounding during the flare, but that you should not be able to see over the nose in the final flare before the main wheels touch. Two thumbs up for Andrew's excellent instructional ability, the constant-descent-rate approach, and for taking a Sunday to spend with us.